- creating a burst of emotion, nourished by a fantastic story and born in the hands of talented watchmakers. three gold Bridges underscore this architecture over which time has no command. Fine Watchmaking. 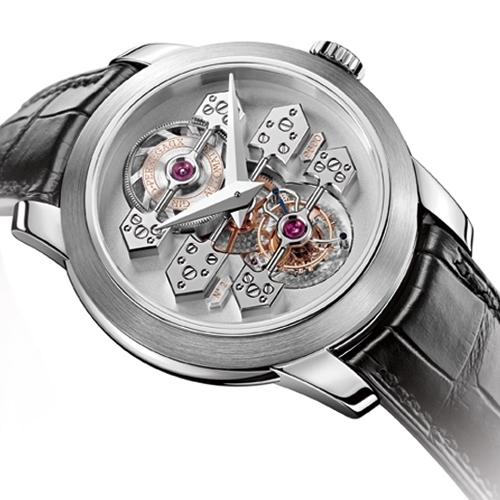 With it, the mechanism becomes a design feature in its own right, extending beyond a solely technical function. The Tourbillon with three gold Bridges won supreme recognition in the form of a gold medal at the Paris International Exhibition in 1889 for bringing together all the know-how of Girard-Perregaux with an entire chapter of watchmaking history. their entire length, a perfect curve. Light glides and reflects off their “mirror polish” finishing, offering a captivating contrast with the matt mainplate. At 12 o’clock, the barrel drum is meticulously skeleton-crafted to reveal the oscillation of the elegant and ingenious platinum microrotor. The tourbillon system is also the subject of particular care as its 80 components need to be assembled in a 10 millimeter diameter. The cage, like the escapement and pallets  bridge are chamfered and hand-polished as are the gold adjustment screws. those that strike the perfect balance between art and technique.